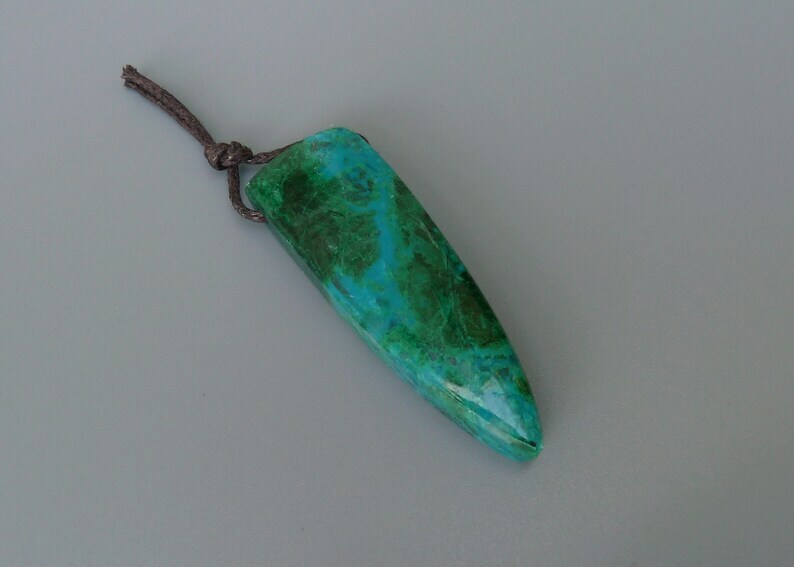 This listing is for one large Chrysocolla triangular or dagger shaped drilled pendant bead. The bead has the shape of a cabochon with a flat back and slightly domed top side. The colors in this exquisite gemstone pendant include bright turquoise blue, dark green, and brown. The fourth photo shows the back side. The name Chrysocolla was derived from the Greek words 'chrysos' and 'kolla' which translate as 'gold' and 'glue'. It earned its name because it was often used as a gold soldering agent. Chrysocolla is prized for it's attractive colors and unique multi-colored patterns. It's color can be among the brightest shade of blue and green, which is caused by its copper content. This mineral often forms with other copper-bearing minerals such as Malachite, Azurite, and Turquoise and is sometimes confused with Turquoise. Chrysocolla is a stone of empowerment through gentleness. It is also the stone of forgiveness, peace, and it encourages compassion.